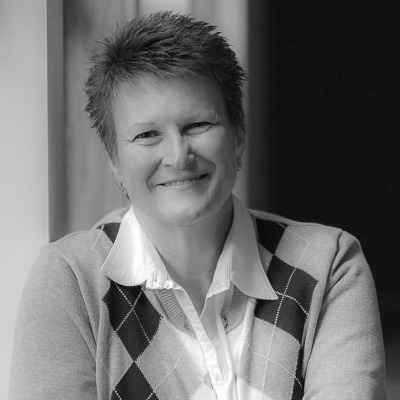 Very interesting piece here by Dr. Christine Sleeter titled, "White people in Ethnic Studies." It offers much food for thought, especially for the Ethnic Studies classroom. The readings on white ethnicity are certain worthwhile and informative. One of my favorite texts from the past was The Ethnic Myth: Race, Ethnicity, and Class in America by Stephen Steinberg. Do read this piece in its entirety and do visit her website. Dr. Sleeter, a nationally-renowned scholar and friend, who has spent decades researching Ethnic Studies and her suggestions for the classroom are more than helpful. "White people in Ethnic Studies"
Ethnic Studies is experiencing a vibrant growth at the K-12 level. I am sometimes asked what place there should be, if any, for white people in Ethnic Studies. This is an important question. Simply leaving white people out of Ethnic studies will alienate them. In addition, Ethnic Studies is invaluable for helping white people see ourselves within rather than outside a multicultural democracy, and as potential racial justice allies. But it is important to use lessons from past experience and research to inform what including white people in Ethnic Studies might look like. Recent history provides an example of how white people’s attempt to be part of Ethnic Studies can go wrong. Writing in his 2006 book Roots Too, Matthew F. Jacobson analyzed the Euro-American ethnic revival movement of the 1970s – 1990s. He argued that, in the absence of a critique of social class, following the Civil Rights movement and rapid diversification of the U.S. population, descendants of eastern and southern European immigrants found the language of ethnic identity and collective rights to express their own concerns. Euro-Americans worked to reclaim history and immigrant heritage; part of this work involved tracing ancestors to European homelands. At the same time, they dissociated themselves from racism by pointing out that ancestors immigrating after the latter 1800s had not owned slaves nor taken land from Indians. Stories of immigrant ancestors’ hardships glossed over forms of racial discrimination that did benefit them in areas such as housing, hiring, and unionizing. Jacobson argued this attempt to be included in ethnic discourse became less a process of remembering history than of re-writing it. Ironically, in a search for ethnic roots, white people used narratives from diverse ethnic histories to construct a homogenizing narrative of heroic and downtrodden, not quite white, European immigrants who triumphed through hard work. This narrative dismissed specificity and privilege while drowning out the Civil Rights narrative that challenged racial dominance. Jacobson observed that, “The ethnic contributions model of American nationality may have been a significant departure from the homogenizing model of the melting pot, but did share . . . an almost absolute erasure of power relations that made for a fairly sanitized and happy national narrative: diversity as feast, the nation as smorgasbord” (p. 56). The use of white ethnicity to create a national mythology that denies racism asserts racialized power. As we think about how to include white people in Ethnic Studies, it is crucial that we not create a contemporary version of the same thing. Historically, as diverse European American immigrant groups submerged their own cultures and languages in order to claim racial power, most lost a sense of ourselves as cultural beings, as well as knowledge of our own ethnic origins. As a result, a growing proportion of white Americans see ourselves as “culture-less,” culture as unimportant, and race as a version of ethnicity that will wither away. For example, in interviews with Ruth Frankenberg (1993) about race, racial dominance, and white identity, white women expressed awareness of and discomfort with racial inequality, but had few concepts with which to examine it other than “long-established modes of cultural description” (p. 196). They could describe “others” as cultural, but not themselves, and they had no other language with which to understand racism. Similarly, Pamela Perry’s ethnographic study of white middle class youth in two high schools (Shades of White, 2002) found them dismissive of culture and ignorant about race. Those in a predominantly white school never had to think about race, ethnicity, or culture, and had difficulty interpreting the question of what white culture means. Those in a multiracial school viewed culture as an attachment to the past, and were simply not interested in that past. Sociologist Stanley Lieberson (1985) reported a link between how many generations removed people are from their immigrant pasts, and awareness of ethnic roots. While about half of white Americans in his study saw themselves as “un-hyphenated,” this was true of about two-thirds of those in the South, particularly in the Southeast where 80% were at least fourth generation. The rate of intermarriage among Euro-Americans rises with distance from immigration, and that distance, combined with intermarriage, prompts disinterest in ethnicity. Yet, many white people assign symbolic value to ethnicity, perhaps as a counterbalance to a sense of lacking culture. Richard Alba and Mitchell Chamlin, writing in the American Sociological Review in 1983, found that ethnically mixed white people often claim a single European ethnic ancestry (such as German-American or Norwegian-American), particularly those in inner cities and suburbs outside the South, and those with more education. That ethnic identity seems symbolically important. Richard Alba, in his 1990 book Ethnic Identity, found white people to view culture as something static that “other people” brought from somewhere else, and ethnicity to be a source of enrichment and uniqueness, experienced mainly through cultural expressions such as food, customs, family celebrations, festivals, and words or phrases from a heritage language. Ethnicity also provided a language with which to talk about extended family. So, when white people take up multicultural education or ethnic studies, their interpretations of what that means stems from their understandings of culture and ethnicity, and lack of understanding or avoidance of race and racism. These are areas that Ethnic Studies involving white people should directly address. I suggest four areas that should be part of Ethnic Studies that involves white people. 1. What culture means; self as a cultural being. 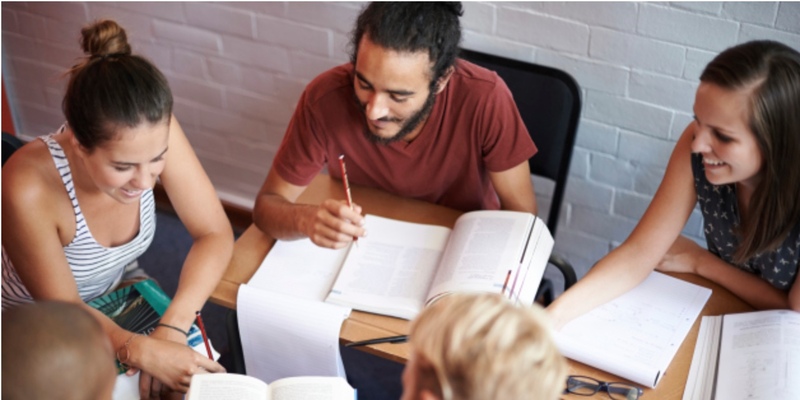 White students commonly see culture as quaint or colorful practices brought from elsewhere, which people of color seem to have much more of than white people. This huge misunderstanding of culture positions white people as nostalgic for something lost, while failing to recognize how everyone is culturally constructed, and how the normalization of white people’s culture maintains power relationships. Anthropologist Ward Goodenough (1976) defined culture as “the concepts, beliefs, and principles of action and organization that . . . could be attributed successfully to the members of that society” (p. 4). By this, he meant all of the knowledge and principles that guide shared behavior and understandings. Understood in this way, everyone is a cultural being; we all participate in shared behaviors and understandings. White people are fully cultural, but use power to make what is cultural appear natural or normal. I do not find it particularly helpful, by the way, to hand students a list of white cultural traits, as such lists sometimes cause defensiveness and do not help them learn to see with a cultural eye. I do find it very helpful, however, to teach students to read their own everyday lives through a cultural lens. There are many ways of doing so. For example, since much culture is learned in the family, I have had students analyze how things are done in their own families through a cultural lens, using questions such as: What is your family’s structure? What roles do family members play? How is affection communicated? How are disagreements handled? How is time structured? What kinds of behaviors are rewarded and how; what kids are punished and how? How are meals handled – what is a “proper” meal, who fixes, it, and when and with whom are meals eaten? Such questions begin to get at cultural practices we learn while growing up. When students compare their descriptions, often they see similarities and differences among their peers, which begins to make culture visible. 2. Remembering rather than re-writing history. Students usually encounter textbook history as boring, and few (including white students) see themselves in that history. At least white students, however, see widely varied representation of people who look like them; students of color do not get even this much. In contrast students find family history to be a highly interesting and viable entree into national history. However, people often interpret their family history within dominant national narratives rather than using family history to create new (and more accurate) narratives. I developed Critical Family History specifically as a framework and methodology to disrupt dominant narratives. For example, if one asks what other sociocultural groups were in the vicinity of an ancestral family, and what the power relationships were among groups (a question white people rarely ask when doing family history), one begins to situate one’s own family story within larger and sometimes conflicting conversations about our pasts. For example, a past involving homesteading is also a past taking up settler colonialism and dispossession of Indigenous peoples. What does it mean to both acknowledge hardships and challenges of one’s ancestors as well as their participation in land theft? When I work with Critical Family History with students, I encourage them to attend carefully to historical records, including those that are unsettling. There will be ancestors that one comes to admire and others one may dislike. Most, if you get to know them, were complex people that you cannot simply venerate or abhor (just like the people in our lives today). But in addition to whatever feelings this research may generate toward one’s forebears, the point is to get to know history in a much more personal and nuanced way, and one in which you can situate yourself and your family. 3. Historical construction and current workings of racism. Whiteness studies interrogates the position of power that Euro-Americans occupy within the context of racism. Whiteness studies focuses on invisibility of racial power to whites, social privileges associated with white supremacy, and relationships between whiteness and identity. Whiteness studies examine the historical processes through which people of European descent constructed race as a concept to justify conquest and exploitation, then gradually submerged their own ethnic identities in order to claim power, trading in power for a sense of themselves as cultural beings. Study of the historical construction and current workings of racism is in many ways no different for white students than for students of color, except that white students typically bring much more defensiveness and denial than do students of color, which may have implications for how it is taught. In addition to grappling with how race works, it is very important to help students see how multiple forms of inequality are linked. In the U.S., we maintain a mythology that we are a fairly classless society. As a result, people often use race to explain class inequalities, or, conversely, reduce racial inequalities to economic poverty. Ethnic studies, in its unpacking of race and racism, should attend to social class as well, including probing historic and contemporary tensions between the white working class and people of color. 4. Becoming allies. Ultimately, including white people in Ethnic Studies should help students envision themselves as allies in work for racial justice. There are various ways doing this, such as involving white students in multiracial YPAR (Youth Participatory Action Research) activities addressing racism locally. Another way is by identifying white moral ancestors, in the words of Linda Christensen — white people who worked for justice. When I began doing my own family history research, I hoped to find at least one anti-racist activist in my family tree. I didn’t, but I did bump into some white moral ancestors along the way, such as Benjamin Butler, for whom an ancestral family seem to have named one of their children. A Union general during the Civil War, Butler helped to free slaves and bring literacy to Blacks in New Orleans after the Civil War. While one can critique other things about him, his work challenging slavery in notable. For white people, learning about white moral ancestors provides a set of racial justice ally role models. I hope these ideas help in thinking about how to include white people in the growing Ethnic Studies movement. Join the Bullock Museum and Great Promise for American Indians in celebrating the 6th Annual American Indian Heritage Day! With House Bill 174, the Texas State Legislature named the last Friday in September American Indian Heritage Day, which recognizes the historic, cultural, and social contributions American Indian communities and leaders have made to the state. The day will feature a range of activities with dancing and drumming performances and interactive experiences for school groups during the morning and an evening program that celebrates the traditional and contemporary performance arts of Texas's American Indian groups. Introduce your students to the culture of Texas's American Indians through first-hand experiences. Call (512) 463-6712 or email reservations@thestoryoftexas.com to plan your field trip to this FREE program. Homeschool information: Homeschool groups are welcome on American Indian Heritage Day and may receive school group rates without assembling a group of 10. Make a field trip reservation here at least two weeks in advance in order to receive our school group rate of complimentary exhibition admission for teachers and students, regardless of the number of people in your group. Questions? Email Reservations@TheStoryofTexas.com or call (512) 463-6712. Arriving at the Museum without a reservation? You are still invited to participate in the activities, which will be free with exhibit admission. Please visit the Ticketing counter upon arriving. Parking information: The underground parking garage entrance is located on 18th Street on the south side of the Museum. The cost is $10 for full-day parking (no re-entry). On special days like American Indian Heritage Day, the garage can fill to capacity, more information here. We suggest carpooling with other families or using public transportation. Parking garages on the University of Texas at Austin campus, or nearby at the Texas State Capitol, are also within walking distance. Discover the diversity of native groups that have called Texas home and find out more about groups currently living in Texas. Learn about cultural traditions including storytelling, clothing decoration, art creation, and food preparation at hands-on activity stations. 10:00 a.m. - 10:45 a.m. and 11:30 a.m. - 12:15 p.m. Dancing and drumming performances by Great Promise for American Indians in the Museum lobby. Celebrate the traditional and contemporary arts of Texas's American Indian groups. This FREE public program will honor American Indians of yesterday and today, with dancing and drumming performances. 6:00 p.m. -- Doors open. Explore the exhibition Comanche Motion: The Art of Eric Tippeconnic. 6:30 p.m. -- American Indian Heritage Day program begins. Register and research so you’ll be ready to VOTE! There are 12 days left to register to vote and 25 days until the start of early voting. 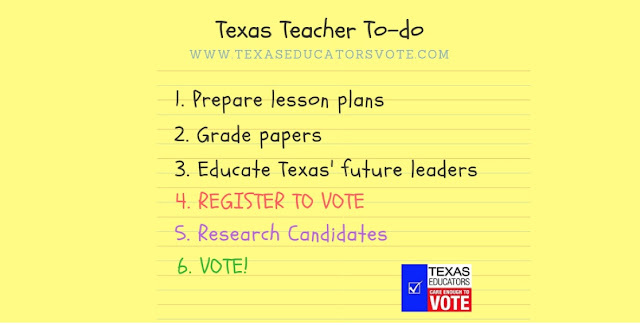 Keep working to register students, staff, parents, and community members. With early voting right around the corner, let staff and community members know about upcoming candidate forums so they can meet candidates and become informed voters. If you don’t have any planned, reach out to your nearest League of Women Voters and Texas Retired Teachers Association to help pull one together. Informed voters make good citizens. a. 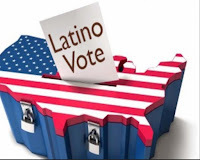 Make sure your voter registration is active and has your current address. b. If you’re not registered, apply to register to vote here. 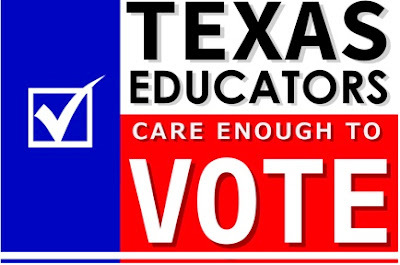 c. Invite voter registrars (League of Women Voters or Texas Retired Teachers) to register students and staff at campus and district events. d. Use this link to let the Texas Civil Rights Project know if you are registering students to vote. It will give you credit for registering voters next time they update their map! a. Teach the Vote has asked all candidates to fill out their questionnaire with education-related questions. Check what your candidates have to say. b. The League of Women Voters of Texas has a Voter’s Guide with candidate responses to their questionnaire. c. Go meet candidates in your area. Attend candidate forums and ask questions about things that are important to you! 3. Get ready to VOTE! 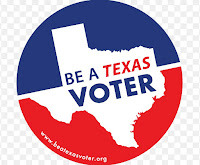 REMINDER: The deadline to register to vote in Texas for the November primaries is October 9, 2018. Registration forms can get mailed in, but they must be postmarked by October 9th, and don’t require postage. In the wake of Bill Cosby's sentencing and Christine Blasey Ford's testimony tomorrow, I can't help but think about how all of us could benefit from both Ethnic Studies and Women, Gender & Sexuality Studies in our schools, whether at the higher education or K-12 level—ideally, at both. How many lives, careers, and reputations could be saved by the knowledge and dispositions that these kinds of courses provide? The answer is not to rail against feminists or the #MeToo movement for ostensibly raising a high bar—which simple human decency and respect toward others is not. Nor should parents or families be entirely blamed. After all, parents got the same (mis)education as their children. Expressed differently, a systematic failure of our schools and society to offer these courses in sufficient numbers means that many of those present at tomorrow's Senate judiciary hearing will have failed to reap the benefits either of an enhanced, critical understanding of human experience or the skills, knowledge, and sense of empowerment and personal responsibility that are crucial to the successful, and ideally, fulfilling, negotiating of difference in a complex society and world. Asian Americans, LGBTQ people, women) rather than the larger human population. common humanity rather than our different identities, experiences, and cultures. to examine it in all of its diversity and understand the difference difference makes. how race, gender, sexuality, and other forms of difference work in the world. Research shows that ES and WGSS courses have positive impacts on these students. self-worth and enhances student engagement and academic achievement. reduction in prejudice and bias, and they become more democratic in their orientation. who do not engage diversity in college. campus and in the community. just workplaces, families, schools, churches, and other social organizations.